FORT LAUDERDALE, Fla., August 15, 2018 – With the stroke of President Trump’s pen on Monday, Aug. 13, 2018, patriotic yacht owners are now able to fly an American flag and register their yachts – over 300 GT – in the United States. This new legislation modernizes outdated laws and brings the United States in line with current times. Until now, U.S. law defined a yacht as a vessel whose volume was a maximum of 300 GT. That law was written in 1920 but was never updated. Americans owning yachts exceeding the 300-GT limit were only able to fly the U.S. flag if they registered their yacht as a commercial vessel. However, commercial vessels such as cargo ships were, and are, held to different operational and construction standards than recreational ones. Therefore, many owners and their advisors did not find this to be a reasonable solution. While a handful of owners in recent decades did pursue acts of Congress for their personal vessels as exemptions, this route is both arduous and expensive and not the right solution for most superyacht owners. For at least a half century, ridiculous regulations prohibited American citizens from displaying their patriotism by flying an American flag on their yacht. With the new legislation, that ends. American yacht owners can now proudly proclaim their citizenship on their yachts. Thank you to all those that made this possible and to President Trump for eliminating over 50 years of bureaucratic red tape. This is truly a historic day for American yacht owners and the yachting industry. “The economic impact of more large yachts flagging U.S. could be significant, as these large vessels would now provide more high-profile opportunities for American crew, keep yachts traveling in U.S. waters and spend more time in our repair and refit yards,” stated Kitty McGowan, president of the USSA. While a specific U.S. Large Yacht Code is now being developed by the U.S. Coast Guard to go into effect in 2020, in the interim, a private yacht over 300 GT that is MCA-compliant, will now be able to fly the U.S. flag. “We look forward to continuing our efforts with the U.S. Coast Guard to help develop and establish the new U.S. flag registry as the best in the world,” said Jay Dayton, USSA advocacy co-chair. 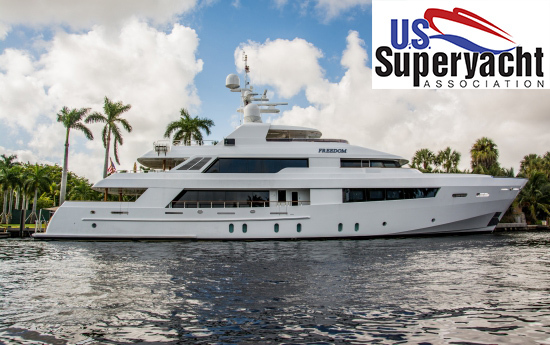 The U.S. Superyacht Association (USSA) is a non-profit trade association incorporated in 2006, whose mission is to promote and support the U.S. superyacht industry and its members worldwide through advocacy, marketing and education. For more information, visit our website at ussuperyacht.com or call 800-208-5801.